I only use about a cup and a half of GFO monthly for my 250 gallon total volume. I also buy the ebay GFO for about $220/25 lbs. Works just as well as the BRS stuff for me... probably use the same supplier. Oh that's not bad, assuming you don't go through much biopellets either? 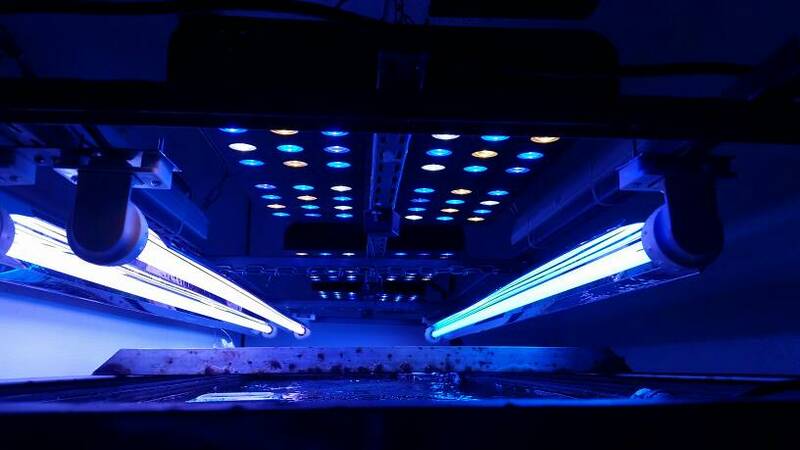 What % do you use for both channels and photoperiod? One Ecobak 1000ml bottle lasts me about 1.5-2 years. 3 Ocean Revive fixtures all set at 90% blue, 65% white. The fixtures have been modded and all green/red/10k diodes (10 total) have been replaced with 3.5k warm white diodes. I've increased my blues to the 90% to compensate a bit for color reproduction that looks visually appealing. What´s the distance between the fixtures and the water surface? Did you notice some response from the colors after the LED customization? or it´s just an aesthetic choice? 7" off the water, lighting a 29" deep tank. I get 100-200 par on the sand, 300-350 mid-level, and 600-700 at the top. This was read with the older Apogee sensor and not the newer one tuned to LEDs, so the values could be a margin higher. 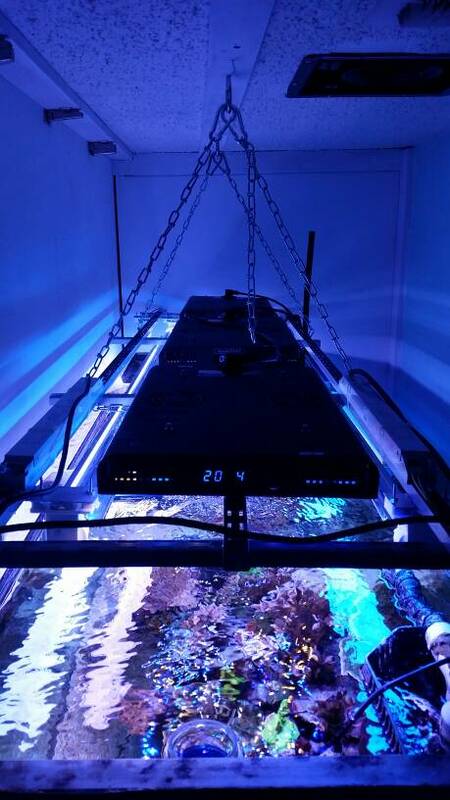 Its too soon to tell with the response from the coral but coloration-wise, my purples are popping, my greens look more natural and not radioactively fake looking, and I'm seeing better color reproduction in the corals overall. It's about the closest I've come to capturing a nice T5 lit look with the LEDs. I finally got a chance to build my light rack and added the T5 bulbs I've been wanting to add to the LEDs for supplemental coverage and spectrum. I used shelf track from home depot. I used the pieces and constructed the light rack. The 3 LED fixtures sitting in the middle are the Ocean Revive T247s with all the 10k, green, and red diodes replaced with 3.5k warm white diodes. The T5s are run with ATI ballasts and are 80w, 60" T5 bulbs. The two front ones are ATI Coral+ and ATI Purple+, with a single ATI Blue+ in the back. I call it my ATY Poorman's Powermodule. All I have to say is holy moly, it's bright! I've had 2 for about a year now and added a 3rd in the past 3 months. What did you test the par with? I used the old Apogee meter but I'm hoping to get my hands on the newly released one that is tuned for LEDs as it should read even higher. Again, my par values were in the 600-700 range just below the surface of the water, 350-400 in the middle, 100-200 at the sand, on a 29" deep tank. The blues were set at 90% and whites were set at 65%. This does not include any interference from T5s or additional supplemental lights, just the Ocean Revive fixtures. Something is wrong with that PAR Meter!! Í have 70% blue and 30% white and got 550 PAR in the surface and 200 PAR in sandbed in a 55cm tanl high. The fixture are above 30cm the water. I feel so objectified but strangely, I like it! I doubt there is anything wrong with the meter, these lights are about 5 years old. The same meter (seneye) read at high as 1400 and as low as 200 ( and everything in between) on my mars. And it is also consistent. I fear the china leds degrade much fast then crees do. I'd check to make sure the blue channel isn't zapped. They had a problem with that the last 2 years in some fixtures. Visually, they look like they are on but in reality, they are barely pushing any PAR. I know nothing of the Seneye but I know I trust my Apogee sensor. Even if the "Chinese diodes" don't last as long, which I wouldn't say based on this experience alone is conclusive, 5 years from a fixture probably bought at $100-$140 that many years ago? You'll have no complaints here from me if I get that from my current lights. I doubt it's just the blue channel I had both lights/both channel at 100% im going back to his house tomorrow and will retest. Fair enough on the value point,and I really wasn't bashing the ocean revives at all, for the price I really like them. I would have a hard time picking between them and mars aqua tho. My apologies good sir... where are my forum manners? Just ignore all the junk in the middle, it's usually an open gap there. I had a couple colonies I have to reglue to the rock but I just wanted to snap a quick picture with the phone before the masses boot me for poor new rack etiquette. Last edited by FarmerTy; 04/18/2016 at 08:45 PM. Just a theory as I saw some reports of it on another national forum. I had a buddy measure his units and he saw a degradation of about 8-10% par in about a year if I remember right. I'm curious though if the degradation is due to the decreasing capacity of the diodes themselves or some other component of the system. The diodes are super cheap and very easy to swap out. I switched out 10 diodes per fixture with warm whites (3.5k) for 5 fixtures for under $40. I've never even soldered before that if it lets you know how easy it is. If it is just the diodes, I'll just swap new ones in maybe every 3 years of the rest of the components last. The reason I chose the OR over the Mars was actually due to spacing of the diodes. The OR fixture was more spaced out which allowed a better coverage on my 24" deep tank. Otherwise, I consider them the same. 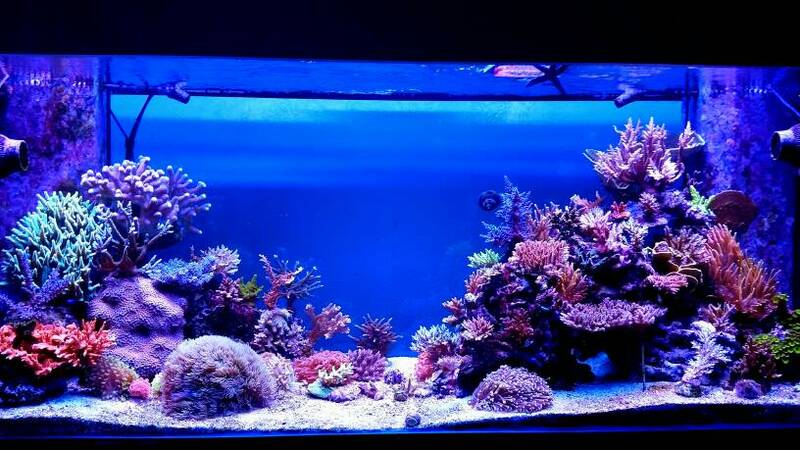 Have you noticed any new colour tones to the corals with the t5s? C+, b+ and purple + must have really warmed things up but also added a bit of pop. ...About the LED degradation, a friend of mine, made a test with an 1 year OR LED and a new one side by side in the same tank and measured the same PAR value, i know 1 year isn't nothing compared to 5 years but it´s a good signal! Last edited by Johnyman; 04/19/2016 at 10:34 AM. I saw the biggest improvement in warm tones when I swapped the 10k, red, and green diodes in the LED fixtures to 3.5k warm white. I saw an explosion of purple, more natural looking greens, and hints of orange/red/yellow return to my system. While too soon to say anything with the T5s yet as its only been 2 days, I at least observed immediately that it didn't reverse any of the color improvement from the diode swap and most importantly to me, it brightened the display and filled in all the shadows. I hope that it will improve coloration as well on my reds/oranges/yellows. Interesting note, after burning under the additional T5s for two days, when the T5s went off and it was just LEDs for the last hour, the tank looked amazing. I'm not sure if that's just visual perception but going from the ultra bright to a dimmer version with shadow detail allowed me to see better contrast visually between the different colors. Either way, the improvement just by switching the LED diodes had me fall in love with the look already and the T5s were just a bonus. Sorry if the pic looks so blue but it definitely is not. Perfect crisp white like you normally see with a T5 or MH fixture. About the LED degradation, a friend of mine, made a test with an 1 year OR LED and a new one side by side in the same tank and measured the same PAR value, i know 1 year isn't nothing compared to 5 years but it´s a good signal! Nice! By chance do you know what he got for degradation in a year when he measured? I'm still curious if the degradation is caused by the diodes. If so, swapping them is super cheap and easy and you'd have an intense burning par machine again like new! He didn´t saw any PAR changes between the two fixtures. Sorry, I reread your post and totally missed that! That's great news!